One of the only books to treat the whole spider, from its behavior and physiology to its neurobiology and reproductive characteristics, "Biology of Spiders" is considered a classic in spider literature. First published in German in 1979, the book is now in its third edition, and has established itself as the supreme authority on these fascinating creatures. 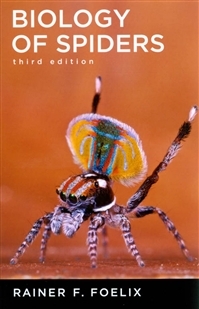 Containing five hundred new references, this book incorporates the latest research while dispelling many oft-heard myths and misconceptions that surround spiders. Of special interest are chapters on the structure and function of spider webs and silk, as well as those on spider venom. A new subchapter on tarantulas will appeal especially to tarantula keepers and breeders. The highly accessible text is supplemented by exceptional, high-quality photographs, many of them originals, and detailed diagrams. It will be of interest to arachnologists, entomologists, and zoologists, as well as to academics, students of biology, and the general reader curious about spiders.